Mark Cuban explained Monday how he believes Donald Trump would be a “puppet president” during an interview with CNN’s Chris Cuomo. The brash billionaire and business mogul said Trump has proven over his run that he has no grasp of policy. And without that understanding, he’ll have to rely on those around him to get anything done. 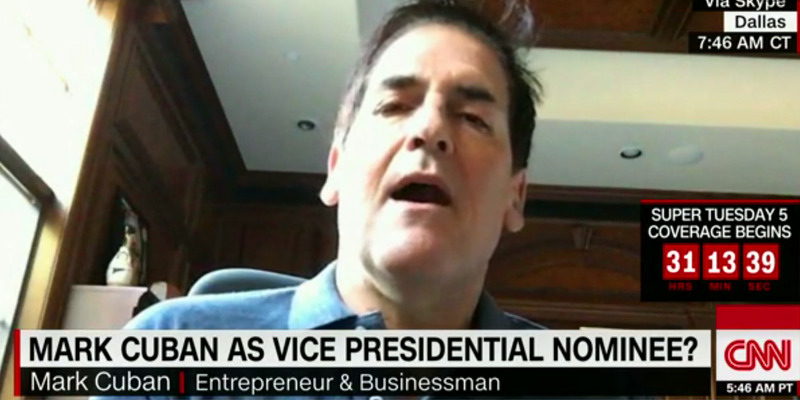 The owner of the NBA’s Dallas Mavericks and star of ABC’s “Shark Tank” also said Trump, the presumptive Republican nominee, would “have to be guided by others in everything” should he be elected in the fall. Cuomo asked Cuban if he’s trying to make a sneaky play to be that person close to Trump as the Manhattan businessman’s running mate. Cuban has previously expressed interest in serving as Trump’s vice president, even as he’s appeared to have soured on Trump’s candidacy in recent weeks. Cuban also expressed interest in serving as Democratic frontrunner Hillary Clinton’s running mate, which Clinton expressed an openness to during a recent “Meet the Press” interview. Cuban also made a point of chastising Trump’s rationale for not releasing his tax returns. Trump has said he won’t release his taxes while under an IRS audit, a reasoning that has been questioned by both sides of the political aisle. Leaders in both parties have demanded that Trump release his taxes ahead of the November election. He continued that whether or not Trump pays a low tax rate, which the returns would show, isn’t as important as Trump’s perspective on taxes. Cuban recently claimed that “it’s not even close” between himself and Trump as to whether has more in liquid assets. He also cast doubt on whether Trump is a billionaire.